Deciding that you want to ask the one you love to marry you is an exciting moment. As you envision a beautiful wedding, cutting the cake and driving off into the sunset for a romantic honeymoon, wedding-related expenses are probably the furthest thing from your mind. Looking at engagement rings and discovering how much they cost can be enough to jolt you back from your dreams and into reality. Before you let ring costs rain on your parade, consider these budget-savvy engagement ring shopping tips to help you buy your sweetheart a ring that demonstrates your love without causing financial distress. Determine Your Budget. It’s very easy to get carried away in the excitement and overspend. You might be tempted to brush this off in the heat of the moment, but you’re likely to regret it later. Determine a budget before you start shopping for rings. The rule of thumb is that the ring cost should equal three months’ worth of income, but this just isn’t feasible for everyone. Choose a budget that will work for you. Know What She Likes. Save yourself the time and hassle of returning a ring to shop for a new one. Before you start looking, know what kind of ring your sweetheart would like. You don’t have to spoil the surprise to find out. Pay attention to the type of jewelry she wears now. Does she prefer white gold over yellow? Contemporary styles or traditional? You can also ask friends and family members for input. Comparison Shop. When making a big purchase of any kind, it’s never a good idea to buy at the first store or website you see. Even though the first place might end up being where you ultimately make your purchase, it’s always wise to shop around. Doing so can give you the opportunity to find a better deal or let a particular jeweler know you’ve found another deal. Know the Four C’s. Carat, clarity, color and cut are the four C’s of engagement ring quality. These four factors play heavily into a diamond’s price and value. Choose Your Metal. The metal you choose for the actual ring the diamond will sit on also factors into the ring’s cost and value. White gold and platinum are both very popular, but you’ll pay about $1000 more for the platinum band. Since you’re likely to want to use the same metal for the engagement ring and your wedding rings, it’s important to make a choice you both like while remaining within budget. 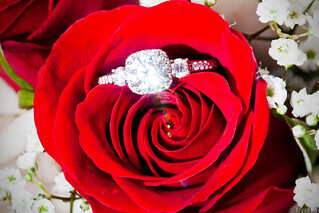 Save the romance for your marriage proposal, and approach the task of buying an engagement ring with a level head. This can be hard to do when you’re caught up in the excitement of a big life change such as engagement and marriage. But it’s a vital part of this very important and expensive business transaction. Do your homework, and be sure your search includes looking at beautiful diamond engagement rings from Bigger Diamonds 4 Less. You can find the perfect ring for your bride-to-be without facing years of debt. A budget-savvy approach ensures that she’ll be happy, and you can feel happy, too.